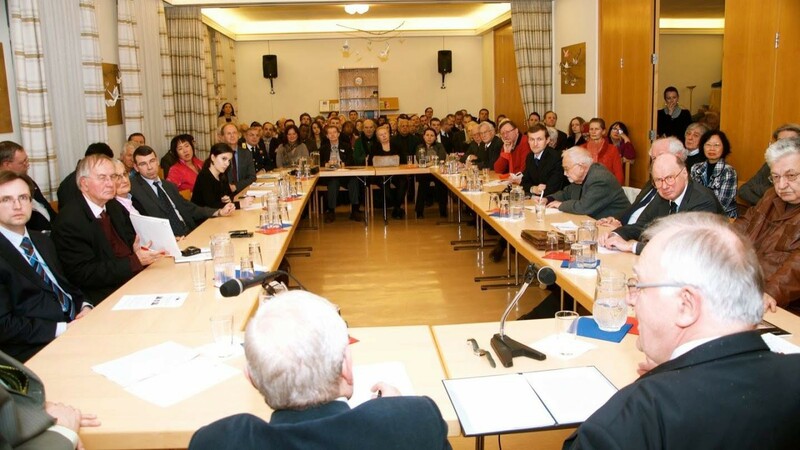 UPF-Austria, Vienna – February 26, 2015: 120 people gathered on February 26, 2015 to attend a panel discussion “The Imperative of an EU– Russia strategic reset” organized by Universal Peace Federation Austria (UPF) in cooperation with the International Institute for Middle East and Balkan Studies (IFIMES), permanent Representation to Austria and the Vienna-based IOs. 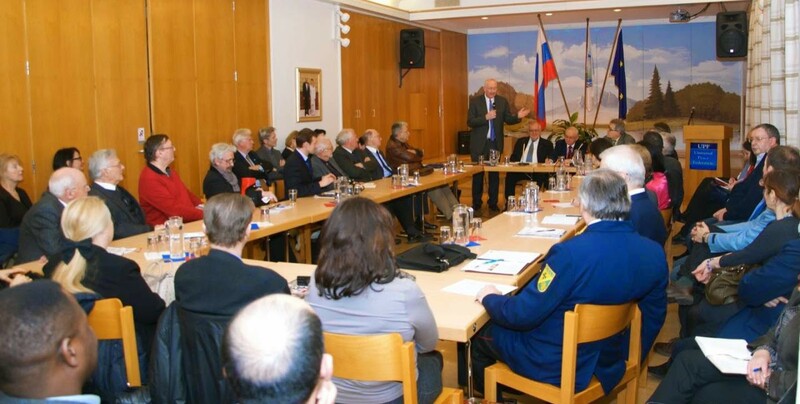 Starting from April 2012 with a conference in Moscow, Russia on the topic “Peace and Security in Multicultural Societies” followed by a conference on “Europe and Russia – Partners in a Globalized World” in Vienna, Austria in October 2012 and in Paris, France in December 2013 on “Eurasia and Europe: Cooperating for a Culture of Peace and Human Development” the Universal Peace Federation tried to contribute to an EU/Europe and Russia/Eurasia dialogue. More recently a conference entitled “Eurasia-Europe Dialogue for Peace” took place in Dec. 2014 in Chisinau, Moldova. Peter Haider, President of UPF Austria, welcomed the guests and reminded the audience that Russia and Europe are geographically neighbors and have various ties in all fields of life since many centuries. The recent disagreements in relation to the Ukraine crises should be seen also as a challenge to restart a spirit of showing interest in each other based on a relationship of trust. Prof. Anis Bajrektarevic, IFIMES Vienna, who takes the credit for organizing the speakers, and masterminding the topic asked the following questions: “The Lonely superpower (US) vs. the Bear of permafrost (Russia), with the world’s last cosmopolitan (EU) in between. Is the ongoing calamity at the eastern flank of the EU a conflict, recalibration, imperialism in hurry, exaggerated anti-Russian xenophobia or confrontational nostalgia scream? Just 20 years ago, distance between Moscow and NATO troops stationed in Central Europe (e.g. Berlin) was over 1.600 km. Today, it is only 120 km from St. Petersburg. Is this time to sleep or to worry? “Russia no longer represents anything that appeals to anyone other than ethnic Russians, and as a result, the geopolitical troubles it can cause will remain on Europe’s periphery, without touching the continent’s core.” – was the line of argumentation recently used by Richard N. Haass, President of the US Council of Foreign Relations. Is it really so? Is there any intellectually appealing call originating from Russia? A lonely champion of antifascism and (pan-) Slavism? Is Slavism, identity, secularism and antifascism abandoned in Eastern Europe – confused perhaps by the mixed signals from the austerity tired Southern Europe and über- performing Central Europe? H.E. Anwar S. Azimov, Moscow, former Russian ambassador to the OSCE HQ Vienna, and the RF’s (Visa) Delegation Head, the EU – Russia Strategic Dialogue, currently Ambassador-at-Large, in the Ministry of Foreign Affairs of the Russian Federation gave a detailed insight into developments of the relationship between EU and Russia from a Russian perspective. He asserted that EU and Russia cannot possibly live without each other; thus, establishing common space is a cardinal strategic task. Russia and EU are natural allies, besides strategic partners. Indeed true as, more than 50% of Russia’s trade occurs with the EU. Then he unavoidably, turned his focus on the Ukrainian crisis; and gave an account of the Russia’s views on the issue. Russia, he says, was never against Ukraine joining the EU, but it was against letting this move harm the economic and defense related interests of Russia. Then he added that Russia in this case is simply a mediator in the conflict; who sympathizes with the people of Southeast Ukraine. As for Crimea, the referendum and the accession that followed were just a matter of historical justice. At the same time, he made special reference in the counter- productivity of the Western sanctions towards Russia, and exerted the willingness of his country to generously participate in a funding scheme for the reconstruction of the post conflict Ukraine. Last but not least, he praised the balanced efforts of the OSCE officials, who played a crucial and objective part in the monitoring process of peace; a role that the EU was not and still is not, ready to play. General of the Council of Europe, who set a different tone on the debate. He quoted from the Declaration of Minsk of February 12, 2015: “Leaders remain committed to the vision of a joint humanitarian and economic space from the Atlantic to the Pacific based upon full respect for international law and the OSCE principles.” By declaring in the very beginning of his speech that although his personal vision has always been that Russia would become a part of Europe, he believes that Russia has not yet finished its transformation after the communist dictatorship. He illustrated the fact that Russia is, besides any strategic and geopolitical ideas, an indispensable part of the European culture and identity. Hence, when he made the provocative and pioneering hypothesis of Russia applying for an EU membership, he argued that the EU would have no grounds in rejecting it. What the two men jointly agreed upon, is that the EU and Russia have not yet found a coherent model to deal with each other constructively; and that this fact is a loss for both parties. The panel discussion was followed by a buffet which included Russian food. There lively interactions among the guests continued.